The best part about living in a city with seasons is the in-between window when summer isn’t quite over and fall is just rolling in. I’m completely wooed by cooler evenings, and all of my griping between June and August about the hot weather is a thing of the past. Unfortunately it takes me until Labor Day to realize I will actually miss everything I love about summer: reading by the pool, playing Scrabble in the park and staking out a patio whenever possible. A few days relaxing in DC this past weekend was exactly what I needed to soak up all the wonderful summer activities one last time and prepare for a new season just around the corner. To welcome cool nights and sweatered days ahead of us, these homemade twix are the perfect (thought probably short-lived) companion. They are the stuff dreams are made of, the exact dessert you’ll want on the nights when the windows are open and the A/C is off. While they will test your patience as you wait for everything to cool, the end is so so worth it. Set out the butter and sweetened condensed milk (if you kept leftovers in your fridge like I did). This recipe comes together better when everything is room temperature. Preheat oven to 350 degrees. Cover a 9×9 baking pan with a strip of parchment paper. This will make it easier to remove the shortbread and caramel from the pan. The parchment paper functions as handles. In a small bowl, whisk together 1/4 cup sugar and 1 1/4 cup of flour. Add 2/3 cup cubed butter with your hands until the butter is incorporated. The mixture will be crumbly and a little sticky. Press the mixture into the bottom of the 9×9″ pan, and bake for 20 minutes – until the edges start to turn a golden brown. Remove from oven and let it cool completely. To cool the layers quicker, I pop mine in the freezer until cool to the touch. In a sauce pan over medium heat, combine the 1/2 cup butter, 1/2 cup brown sugar, 1 tbsp. corn syrup for shine, and 1/2 cup sweetened condensed milk. Bring to a boil, stirring constantly until everything is incorporated (you don’t want the mixture to burn, so keep stirring). Once boiling, stir for 5 more minutes, then remove from heat and stir for an additional 2-3 minutes. Pour the caramel mixture over the shortbread crust while still in the pan. This keeps the caramel on the top of the cookie. While that is cooling, melt the cup of chocolate chips with 1tbsp coconut oil in the microwave. Stir every 30 seconds for about 2 minutes. Don’t add more chocolate chips once you start melting everything. It will not melt evenly and your chocolate will be lumpy like mine is in the pictures. Once the caramel has hardened, remove the cookies and caramel from the pan and cut into strips. I cut 1-in cookies and then cut the whole square down the middle leaving me with about 16 twix. Pour chocolate on top and let it cool. Enjoy! 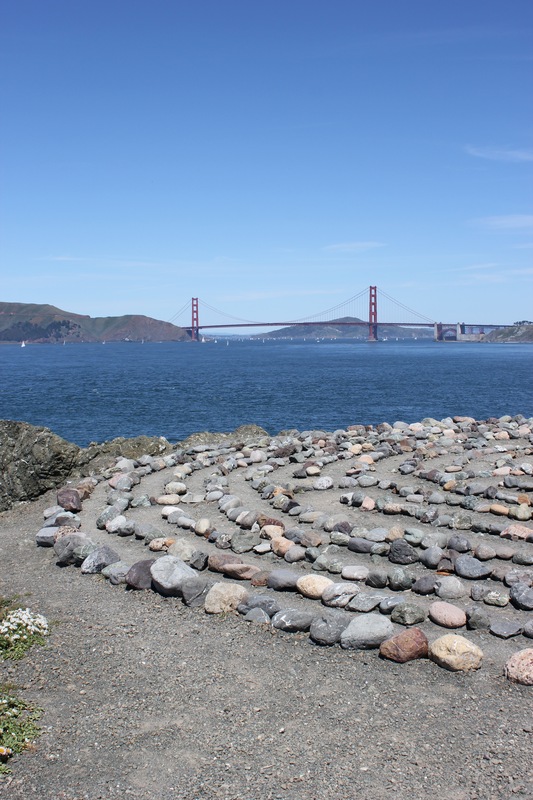 Before my trip this past April, I spent just one day in San Francisco almost eight years ago. Via a double decker bus tour, I crammed in all of the sights around town with my very best friend and her family. We saw the Painted Ladies, watched artists atop Twin Peaks, hiked Muir Woods and ate sourdough bread in Fisherman’s Wharf. This time around, I visited for more than a week which lead to lots of exploration and many indulgences. I left this past April even more in love with the city than my first trip years ago! Below are highlights from my trip – everything I would highly recommend if only you were sitting right here next to me. Craftsmen and Wolves – My dad and I both visited this coffee shop twice during our stay just for The Rebel Within – a savory muffin with a soft-boiled egg baked inside of it. I swear I’m still having dreams about it! Fenton’s – Located in Berkeley, this ice cream shop is famous for inspiring the last scene in the movie Up. Basik Cafe – I had heard all about acai bowls, but this was my first time trying one. Go hungry! They’re the size of your head and will leave you full til lunch. Jane Cafe – Killer salads in a fun cafe with chill vibes! St. Frank Coffee – If I remember correctly, someone on Yelp referred to this as, “The Apple version of a coffee shop.” The baristas were incredibly friendly which distracted me long enough from panicking about spilling my latte all over their spotless counters. Seed and Salt – A great place to stop for a quick bite or a full meal. Tartine – My sister and I waited nearly thirty minutes for one of their world famous croissants. 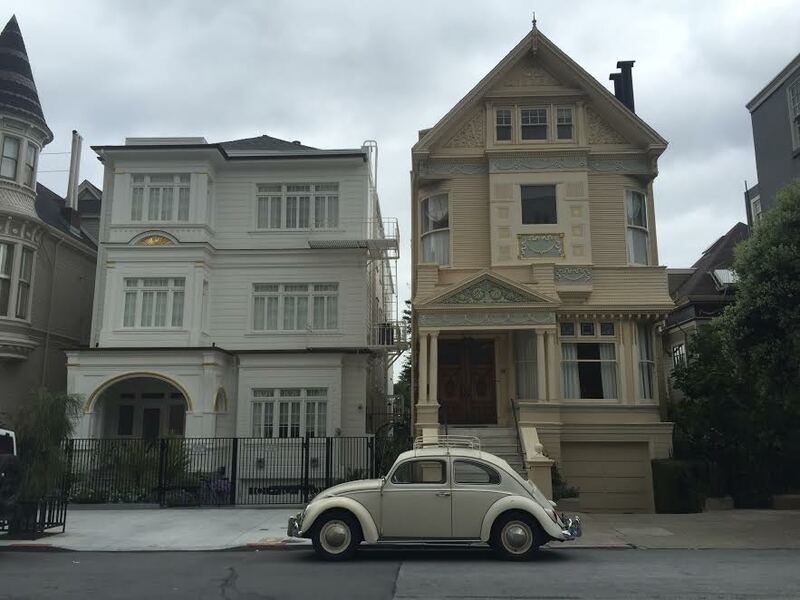 The bakery is pretty cramped, so in the future, I’d take our treats up the block to Dolores Park instead. Union Street Papery – Hands down the best paper store I’ve ever visited. I was in the tiny shop for nearly an hour ogling every card! Before entering the store filled with party supplies, stationary and planners galore, you first walk through an archway, past a small garden with a pond and into the shop. Pretty sure I gasped out loud when I rounded the corner. 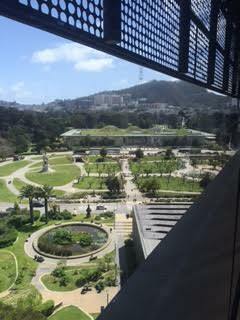 The DeYoung Museum – There was a touring Oscar de la Renta exhibit (pictured above) which took my breath away. Easily the youngest one there on a weekday afternoon, I loved hearing the commentary of the senior citizens around me. “Ooh, I’ll take that in a ten.” “Oh my, just look at that embroidery!” Their enthusiasm and appreciation for all of the incredible gowns was welcome company as all of our jaws kept hitting the floor. Go for the lookout deck on the top level, but don’t prioritize this museum over a sight you really have your heart set on. Green Apple Books – My sister’s favorite used bookstore in the city! There were cookbooks galore, graphic novels and even small zines which combined the two. If only I had left more room in my suitcase, I guarantee I would have left with more titles in tow. The Exploratorium – Filled with interactive exhibits about science, math and physics, this museum kept us busy throughout our entire visit! I recommend Adult Happy Hour from 6-10p.m. every Thursday when only adults are admitted. There’s so much to interact with you’ll be glad you’re not elbowing small tots out of the way because you’re excited about your own turn at each station. 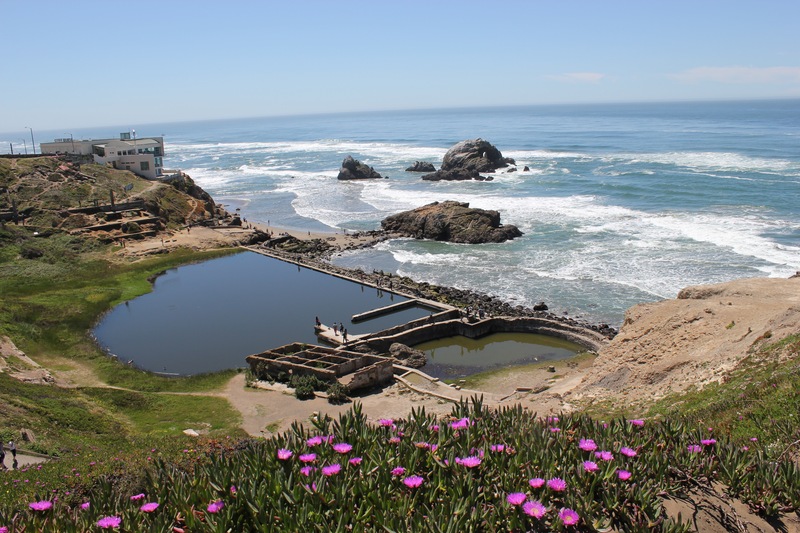 Sutro Baths – A former swimming pool for San Franciscans, all that is left now are the ruins. Climb all around the structures where former pools existed and explore adjacent caves which have views of the ocean on the other side! Or, listen to more about the history from the podcast 99% Invisible. Lands End – Near the end of Golden Gate Park (or at least what was the end for us) lies an incredible lookout of the Golden Gate Bridge complete with a rock maze and stunning views of the water. You’ll wonder why you took all of the paltry shots leading up to this point. 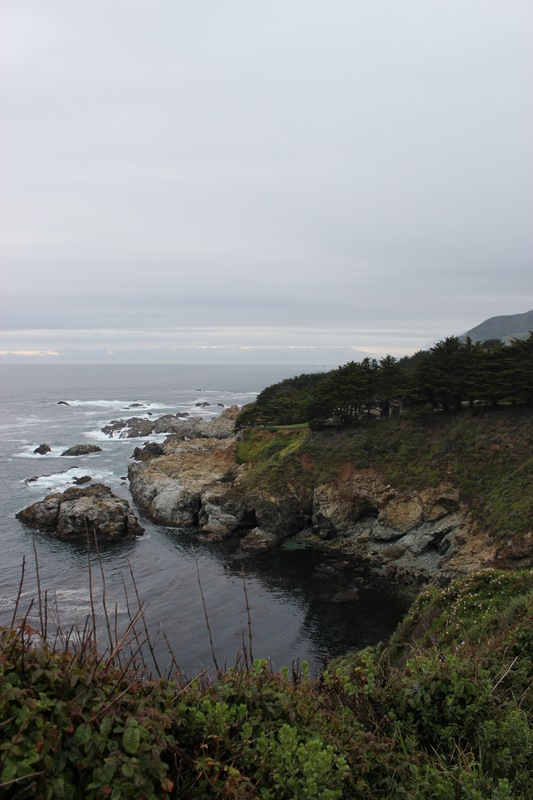 Big Sur – We drove past Big Sur on California One on a cloudy day, but I still had a blast! I can only imagine how beautiful these sights are on a bright, clear day. Crissy Field – Crissy Field has got to be where they have photo shoots for REI and Lands End catalogs. Walk along the path and you’ll eventually encounter a small beach which leads right into the bay. I dare you to try not reenvisioning your savings going toward one of the adjacent waterfront properties. 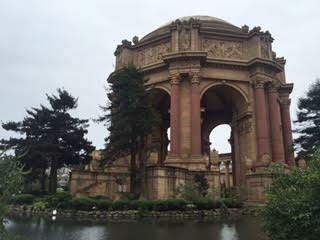 Stop by the Palace of Fine Arts nearby and take in the grand architecture (and maybe a swan or two if you’re lucky)! This was (truly!) the easiest recipe I have ever made in all twenty-four years of my existence. D.C. was hit with more than two feet of snow in some pockets of the city this weekend, and baking was one of the only things keeping me sane. Unfortunately, my past self deemed a small loot of potatoes more important to lug home instead of ingredients for a more complicated bake. These muffins took just 10 minutes to whip up – a mere fraction of the duration of Snowzilla. I would’ve killed someone this time yesterday as the Cabin Fever set in if it meant having access to a kitchen like the ones in Great British Bake-Off – all the ingredients a girl could need! Alas, all we’ve got are items for muffins*. At least Google pulled through and Food.com didn’t disappoint (although I was skeptical of the recipe’s legitimacy ’til the moment I bit into the first muffin). These guys are keepers: a fruit serving and a sprinkle of chocolate! What’s not to love? Stir in flour, baking soda, baking powder and salt. Spoon into medium size muffin pan lined with paper cups. *Consider this my formal pledge to document more photos of the ~*baking process*~ next time. Sometimes you’re trying to beat the clock ’til Meet the Press comes on, and before you know it, everything’s already waiting nicely** in paper muffin cups for baking. Smh. Next time! **Seriously – they’re that easy! Done before you know it!